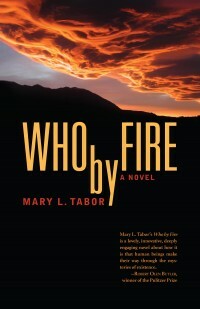 Last night, I had the opportunity to sit down and meet with writer, Mary L. Tabor, who is the author of the novel, Who by Fire. I had arranged for a couple of girlfriends to join me and participate in a little “book club” meeting after we had all finished reading the novel. Mary was very kind to take some time to chat with us and answer our questions related to her book. It is a very rare and special opportunity to meet with the actual author of a book that you have chosen for a group reading and discussion. We were all aware of the uniqueness of the occasion, and we had a great time talking about one of the most beautiful and poetic love stories that I have ever read with the woman who created it. Who by Fire is a novel written from the point of view of a man who has recently lost his wife to an insidious disease, and who now has to come to terms with the emotions and complications that resulted from her betrayal of their marriage in the last year of her life. The narrator, Robert, is such a relatable character that you cannot help but join him on this journey of self-discovery and forgiveness as he tells a story that he does not actually know. Set in the Washington, DC area, this love story is a must-read for anyone who has ever loved, longed for a lover, or even lost a great love. Tabor writes in such a way that you often feel as though you are reading the words of a lover’s song; unrequited love and longing, regret, betrayal, and guilt layered thick in the lyrical prose. If you are looking for a story that is very different from anything out there on the “pop-culture” market, this is a great novel to purchase for yourself, or as a gift for someone special in your life. I would also recommend reading it for a high-level book club discussion. The emotions and life questions that this story evokes may surprise even the most experienced reader. Here is the link to purchase Who by Fire on Amazon. If you have any comments or questions, please feel free to post them in the comments section.